The pesky mythological creatures filled the sky, regularly swooping down to wreak havoc on the undead rock band engaged in a fracas with other, less well-intentioned zombies below. Our group of zombie rockers had been punching, grabbing and throwing its way through the streets towards a cemetery for maybe 15 or 20 minutes at this point, with seemingly everyone but the screaming living trying their darnedest to send us back to hell for good. There was enough chaos being caused by the slow, lumbering zombie baddies and occasional “accidental” punching of each other that the airborne aggressors were being largely left to their own devices. But there is only so much pushing that a bulky undead drummer is willing to take before he grabs an agitator by her throat and repeatedly smashes her face into the ground. It had fallen to me to make the skies a little friendlier, so that’s what exactly what I did at PAX Prime while playing Ska Studios’ Charlie Murder. Another scream escaped from her throat as she bit the dust, and that was that. However, the magical flying creature impeding our progress had friends. Well, two can play at that game. The other members of the group had continued on their merry little way pummeling the crap out of the enemy zombies, causing various pickups to drop, including guns. A few pulls of the trigger later and the XBLA Fans crew had achieved complete air superiority. The screams of a unicorn ringing through the headset were music to my ears. On-screen, the tormentors actually took the form of witches on broomsticks, but they were voiced by the studio’s very own one-horn. Ska Studios Art Unicorn Michelle Juett-Silva smiled proudly when explaining that she and her husband, Lead Dishwasher James Silva, had performed nearly all of the voice-over work for their game. Another stretch of the demo showed off the unicorn’s pipes even more. 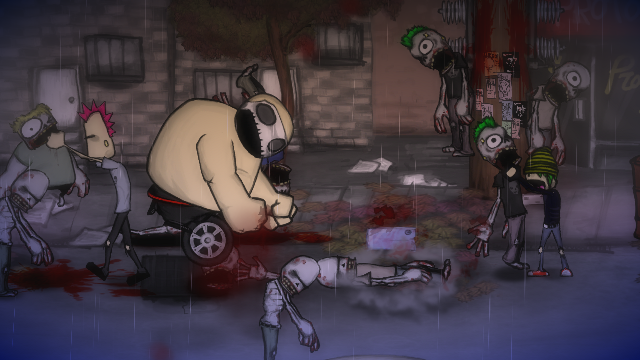 A quick cut-scene showed some NPCs attempting to escape from the zombies with their lives intact by navigating through the clearly haunted cemetery. They ran right smack into a ghostly little ghost that bore a striking resemblance to the girl from The Ring. (Silva would later admit that they are indeed his homage to Japanese horror films.) The girls can’t attack, but operate more as environmental hazards moving in fixed patterns. Coming into contact with them elicited one of Juett-Silva’s recorded screeches and meant death for the player. All of the game’s enemies are brought to life by the Silvas. In fact, the only instances in which outside talent was used was for an in-game radio show that plays when gamers enter shops. She referred to the talent on the show as “guest voices.” Anyone in particular whom gamers would recognize? “The One of Swords guy. He does a rant about selling out and junk,” Juett-Silva said of Activision Community Manager Dan Amrich’s role in Charlie Murder. Amrich’s turn as a radio host is tongue-in-cheek; like many of his contemporaries, the man they call One of Swords was an accomplished game journalist before “selling out” for his current Activision gig. Despite being a mouthpiece for the world’s largest third-party publisher of video games, Amrich does an admirable job of staying true to who he is: a gamer. One could pay a similar comment to Ska. Yes, the two-person indie studio is published by Microsoft, but that doesn’t appear to have changed its approach to game design any. Ska’s game is about a group of rockers that end up going to hell and come back to beat the hell out of everything in their way. This includes handgun-brandishing witches on broomsticks. It’s an interesting weapon choice for a creature that has traditionally relied on magic attacks in various lore over the years. 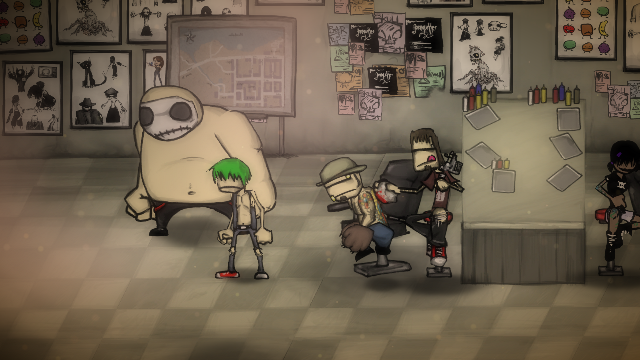 Silva’s own game is a co-op brawler that plays a bit like a goth-themed Scott Pilgrim. It won’t entirely be ground-and-pound, though. Charlie Murder‘s PAX demo featured one prominent break from the standard “punch everything that moves” gameplay. 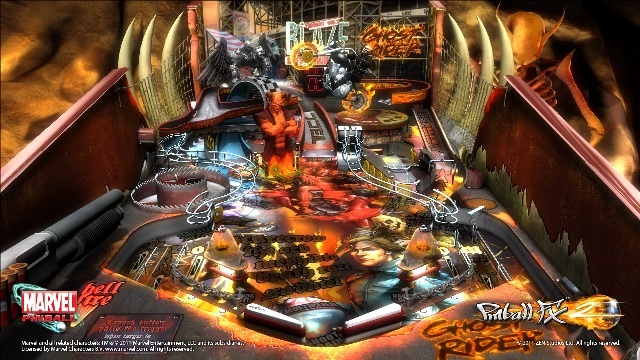 Its last segment had players going airborne and taking on waves of enemies serving as little more than gun-fodder that eventually gave way to a mini-boss after a few moments. What looked like Friday the 13th‘s Jason hung out the back of a helicopter/bus hybrid and unloaded bazooka fire at us. Once this latest threat was overcome, the actual level boss was shown. Instead of another fight beginning, though, he faded out as the demo ended. I pointed out that this sounded like another odd but interesting mash-up. “Yeah, and also there’s like a sasquatch museum leading up to it,” Silva revealed. “If you land in the cemetery at the beginning there’s a big billboard in the back that says, ‘Come visit the Sasquatch Museum.’ But as it turns out there’s like, robot-sasquatches there.” Of course there are. Why wouldn’t there be?